It's happened to you. You received a phone call out of the blue, or you bumped into someone who led you to a new job, a new relationship, or opportunity that totally changed your life. You probably even said, "Wow, what a coincidence I met so-and-so." But . . . did you ever stop to ask what caused that person to be right there, at that exact moment, in your path? 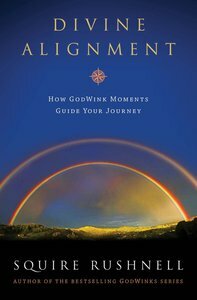 It was Divine Alignment: the arrangement of coincidences into a pattern of alignment so astonishing they could have come only from a higher source. In this inspiring work, SQuire Rushnell shows readers how they can navigate life's thorniest hurdles, rediscover the deep meaning and impact of personal prayer, and develop the individual conviction and wherewithal it takes to reach their full potential and fulfill their most ambitious dreams by honoring the book's seven easy-to-follow steps. In his charmingly avuncular and wonderfully optimistic voice, SQuire shares moving stories from his own and others' lives to show the awesome strength inherent in what he calls God's Positioning System, or GPS. All of us, he assures readers, can use our own personal GPS to grow more closely aligned with God and become vastly more effective, successful, and fulfilled in our relationships, careers, and everything we do.